Forty-eight hours in France and there was something I was craving pretty badly. 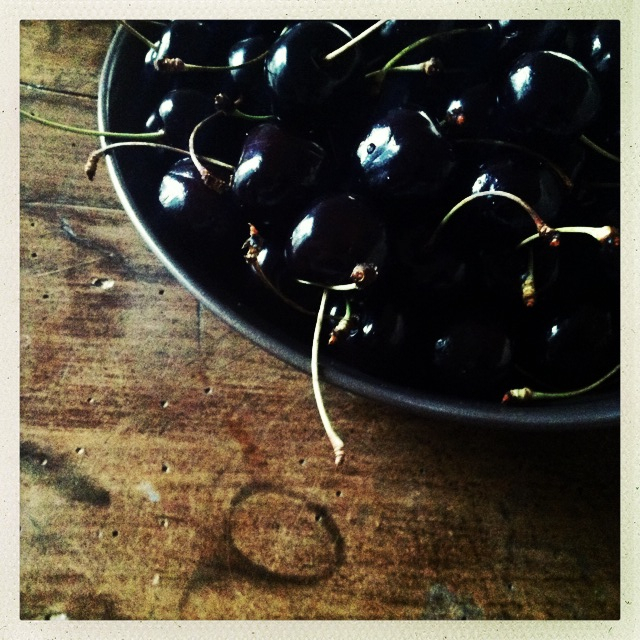 Cherries from this region—l’Yonne. 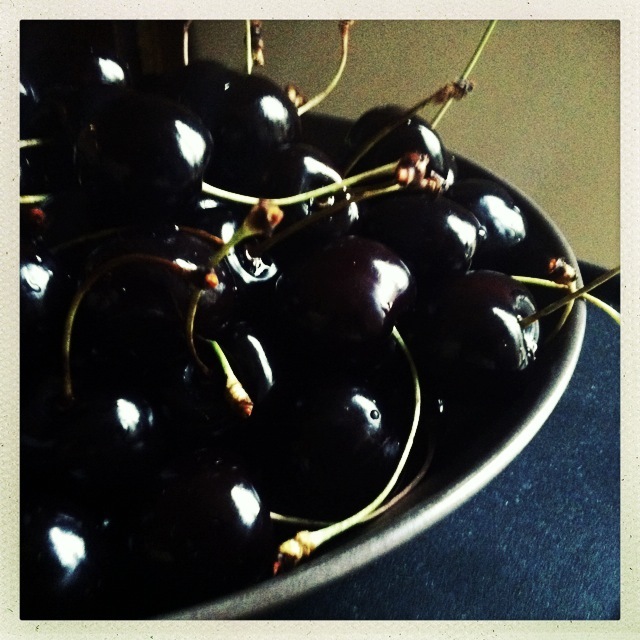 We’ve got wonderful cherries in Italy (Vignola, Ferrovia, Durone etc. ), but nothing—I’m not sure why—quite compares to these almost black beauties that are sold by the road and go out of season before you’ve had your fill. As the Italians say, “Una tira l’altra.” One pulls the other. Dark, glossy, densely juicy, sweet, tart. You think you’ll eat two, and before you know it you’re well on your way to a stomach ache. It takes true discipline to stop. That said, they’re best when fresh from the picker and don’t improve with time in the refrigerator drawer. So we get small quantities to eat immediately. Then repeat. When our eyes are bigger than our appetites, which is too often the case, and we end up with cherries in più, we like to make cold soup out of them. Once upon a time there was a recipe, but it went from stained to dog-eared to lost. So now we just play it by the senses. I’ll share the basics with you, because I’m sure you can’t go wrong. And if you do, there are a thousand websites to set you straight. But, really, you won’t go wrong. With ingredients like these, it’d be a challenge to produce something less than delicious. 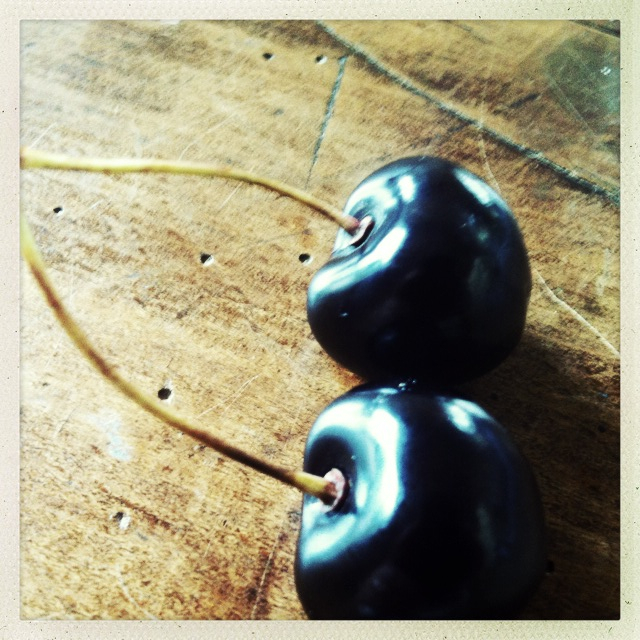 You take your cherries (about a kilo, or just under 2¼ pounds, but I don’t even bother to weigh them), and you pit them. Nasty job, but someone’s got to do it! Next, I put the cherries in a pot with a bit of sugar and a small amount of water. Not too much, because the soup can tend towards “too sweet” depending on which wine you choose to add next. Cook and stir your cherries until the sugar is dissolved, then add a bottle (if that makes you squeamish, use a bit less) of lovely white wine. Dry, not sweet. Or red. Or, as we often do here, a combination of white wine and Ratafia. (Ratafia is a red, sweetish wine leaning toward a Port flavor, so we use less sugar when cooking with it.) Bring just to the boil, then simmer until the alcohol has cooked off and your liquid has reached a consistency you like. You can add cinnamon sticks, cardamom or clove during this phase according to your tastes. Remove from heat. Let cool, then refrigerate. Eat as is, or with a dollop of ice cream or crème fraiche. NOTE: Some recipes call for thickeners—a bit of cornstarch or flour—but I’m not big on those additions and have had great success ignoring them. The soup gets adequately thick and syrupy on its own. Another thing I like to do, especially if I’ve got too many summer stone fruits lying around, is add chopped apricots, peaches or nectarines right before I put the cooled soup in the refrigerator. Delish. 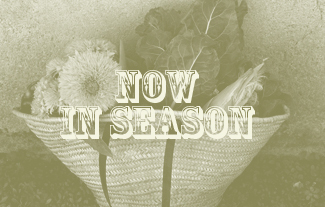 This entry was posted in FRANCE, IN SEASON. Bookmark the permalink. Oh YUMMMM! Once I was given a recipe from some Lakota Sioux friends I had at the time. It called for Cherries only to be made into a pudding like thing. It was delicious. I have lost the recipe over time, but still make something like it today. I wonder if your recipe is like clafoutis? Do you put them in a slightly sweet custardy mixture and back it? Whatever it is, I’m sure it’s great. I love it that you had Lakota friends. That must have been very special. It would have been for me. Your photos are fantastic. My mom used to make cheery soup , I have to ask her for the recipe.. Thank you! I love your typo…you wrote “cheery soup.” This must be a Freudian slip, because it is very cheering. If you find out, let me know how your Mom makes it. That is one of my better typos, maybe it is a “cheery soup” because you end up with blue lips and teeth looking like a clown? In Hungary, cold cherry soup is a classic and includes sour cream and dry red wine. When the cherries are done, they make it with fresh apricots. The best dessert I ever had in France, though, was those very cherries picked after dinner by the man of the house who was up on a tall ladder while we guests on the balcony continued to enjoy his wine and encourage him. Thanks Mary! 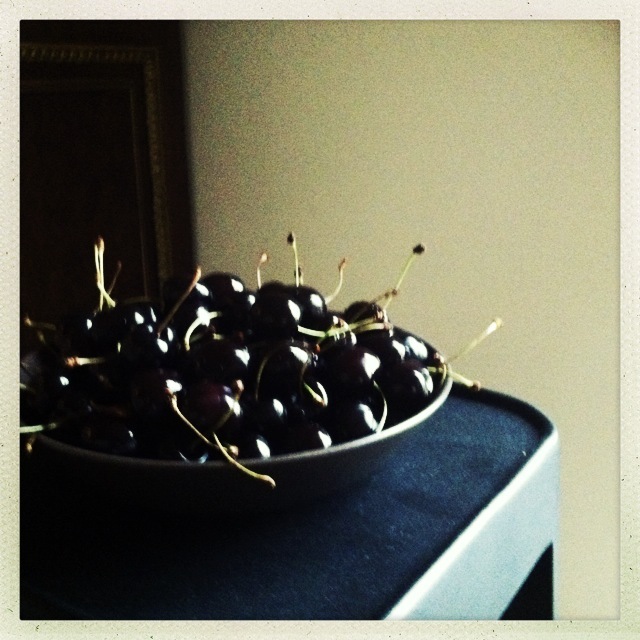 You’re right…the cherries, alone, make a perfect dessert. In fact, I just polished off a few. Hope all is well on the West Coast. Too bad you can’t pop over for a roast chicken and some Petit Chablis. Who says I can’t? I arrived in Tours yesterday for a 3 week teaching stint and am enjoying my first cafe au lait while contemplating whether my desire for a real pain au chocolat is worth sloshing through the rain this morning. Yeah, it is. It absolutely is! So happy to hear you’re back!! That is great news. Will this be an ongoing arrangement? and you call this ‘soup’? sounds like the most fabuloso dessert to me! you’re killing me here. softly, but killing all the same. One of my favorite songs. Good ol’ Della Reese.